The Magic 45°Holding the tambourine to get a fully balanced sound. 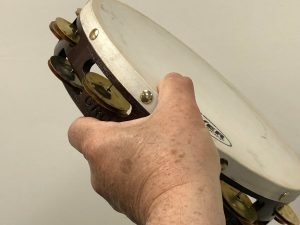 I have often been asked about my tambourine grip, and while I employ a range of variations, my basic “go-to” technique is to hold the tambourine at a 45° angle to the floor. The reason is simple – it produces a balanced jingle sound. Think about it, the tambourine jingles need to vibrate to produce sound and they have a harder time vibrating if they are lying flat. Try this, hold the tambourine at a 90° angle to the floor (perpendicular) and strike the tambourine. Now do the same thing with the tambourine flat. Notice that the sound is dry (short) when held flat and rather “wet” (resonant) when held perpendicularly. So, by employing my 45° concept you will get a jingle sound that is full, resonant and articulate. I reserve the horizontal (flat) position for passages where rhythmic clarity (staccato playing) is paramount!